The windy port city of Chicago is a major U.S. commercial and industrial center with a storied past. In the 1770s, the son of an African American slave mother and businessman father from Quebec named Jean Baptiste Point du Sable founded a trading post located at the southwestern tip of Lake Michigan. When this post was connected to the railway system during the nineteenth century, it quickly grew into the major economic center of the Midwest. The Great Chicago Fire destroyed almost a third of the city in 1871, but residents were determined to rebuild and brought in famous architects such as Louis Sullivan and Frank Lloyd Wright. A spike in real estate prices toward the end of the nineteenth century forced property owners to build upward, and the first skyscrapers were born. The early twentieth century saw Chicago become a metropolis of organized crime, political corruption, social unrest, and racial tensions. The thriving city of Chicago now boasts world-class dining, shopping, and interesting architecture. The Sears Tower, the John Hancock Center, and the Aon Center are three of the tallest buildings in America, and there are dozens of examples of early architecture by Frank Lloyd Wright. Visitors will find many museums and cultural offerings including the famous Art Institute of Chicago, the Museum of Contemporary Art and the Chicago Symphony Orchestra. 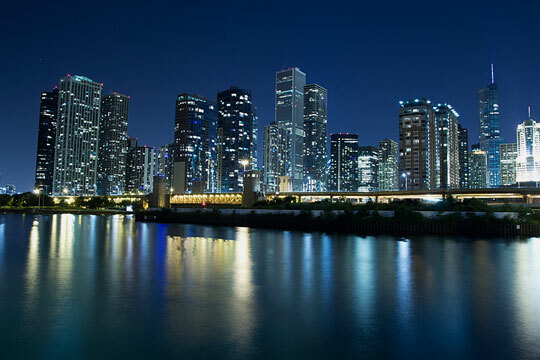 Chicago is a musical city known as the home of soul, gospel, jazz, and Chicago blues. Restaurants provide cuisine from around the world, but Chicago is especially known for its famous deep dish pizza. Residents take great pride in their major league football, hockey, basketball, and baseball teams. City of Chicago Government - official City of Chicago website. Chicago Weather and News - current weather in, and recent news about, Chicago. Chicago Product and Service Guide - Chicago enterprises. In-depth Chicago information and news can be found on these regional Chicago Libraries and Chicago Newspapers pages, respectively Visitors to Chicago will find this Choose Chicago website useful.